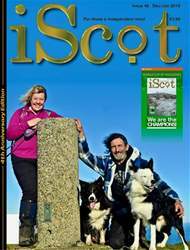 Digital Subscriptions > iScot Magazine > December / January 2019 > Holiday Blues, Harsh Vacation Truths! THE FESTIVE season is here again, with all the frantic preparations, visits and guests, stresses and panics, hustle, bustle and gorging. What better way to counter the inevitable sense of anti-climax than to sit with your feet up, beside a cosy ire, with a dram or a good Scottish gin in your hand, browsing through the new year holiday brochures? These days, many of us seek far-lung destinations with novel entertainment, sights and experiences as an alternative to the jaded and over-exposed Costa del turista. One type of destination which has risen in popularity is thailand, with one million tourists from the UK in 2016, and 714,258 UK tourists between January and September this year. As ever, there are no separate statistics for Scottish travellers. However, the mysteries of this exotic country, complete with Asian culture and cuisine, and the novel lure of a growing trend and expansion in elephant tourism, are atracting Scotish tourists along with those from the other countries of the UK.